From the most recognized name in the leather industry, the latest innovation in top-of-the-line leather care! This cleaner safely and effectively lifts away dirt and foreign particles to reveal like-new leather. Its specially balanced formula is non-greasy, non-tacky, and will not migrate to the surface. Many all purpose cleaners boast a pH level of 12 or 13. This is harmful to leather, as the porous surface drinks up the chemicals, depleting the life-giving oils in the hide. When using these harsh products, the cleaning towel may turn brown. What appears to be dirt is actually chemicals from the tanning process being removed. These potent cleaners actually de-tan the leather, priming it for deterioration. Lexol Leather Cleaner, formulated about 25 years ago specifically for proper leather cleaning, has an optimum pH balanced cleanser (between 5 and 5.5; slightly acidic) with purified water, premixed and added to a newly available towelette from DuPont. These individual towels are incredibly strong, able to stand up to tough jobs, and absorbent, holding more solution than conventional wipes. Lexol Leather Cleaner contains no petroleum solvents or silicones. Just a natural aqueous emulsion for lubrication nourishment, that easily soaks into the internal fibers. Lexol Leather Cleaner is as gentle to skin as it is to leather. It is environmentally safe and non-flammable. To this day it is unparalleled in controlling greasiness and oil releases. Leather, for all its strength and endurance, is actually vulnerable if not cared for properly. Grease, grime and pore-clogging dirt must be removed if longevity and durability are concerns. Using the correct cleaner is the first step to good leather maintenance. Lexol Leather Cleaner is designed to perform on all leathers, except suede, and prepare it for the next and final step—conditioning and protecting with Lexol Leather Protectant Quick Wipes. 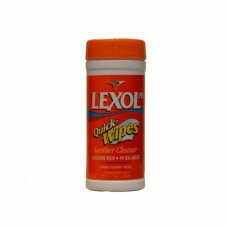 Simply wipe the offending dirt away with Lexol Cleaner Quick Wipes. Very stubborn spots may benefit by using an upholstery or soft leather brush to further agitate the leather. Keep these wipes handy in your glove compartment for emergencies, or just for quick touch-ups anytime, anywhere. The convenient pop-up dispenser seals in moisture so your pre-saturated wipes are always ready for action. With children or pets, spills and spots are inevitable—these Lexol Leather Cleaner Quick Wipes are a lifesaver. Lexol suggests not using its products on hot surfaces, or in direct sunlight. Leather care is a two-step process of cleaning then conditioning. Lexol Leather Cleaner is especially effective when used hand-in-hand with Lexol Leather Conditioner. In the southern-most states, Florida, Texas and Arizona, it’s recommended that leather care is performed once a month. In less severe climates, protecting your car’s leather interior every three to four months is sufficient.